The Student Card is a multifunctional chip card that acts as the TUM student I.D. The face should be the predominant image in the photo, taking up 70 to 80 % of the height of the space. The face should be evenly and well-lighted with clearly recognizable eyes (no shaded glasses or hats). The image should not contain other people or objects. Head cover of any kind is not permitted (Except if worn for religious reasons). The background may not contain distracting contours. Please note: The photo you upload in your TUMonline account (e.g. during the online application) will automatically be used for the Student Card. If you want a different photo on your Student Card, and the Student Card has already been printed, we have to issue a new card, which is connected to a fee of 15 euros. The Student Card is a contact-free card, meaning it simply needs to be held up to the card reader to be scanned or to make credits or charges. Note: If you store multiple cards with payment functions in your wallet, they can interfere with each other! You are enrolled for the relevant semester at TU München and have received an enrollment e-mail from us. Regular students may pick up their Student Card upon presentation of a valid ID (identity card, passport) at the SSZ Service Desk (Arcisstr. 21, Room 0140) from March 25th to April 26th 2019 for summer semester 2019. Please do, however, allow approx. 10 working days after your enrollment for the creation of your card. If you are enrolled less than 10 days before March 25th, the issuing of your student card will be delayed accordingly. If you will be sending someone to pick up your Student Card for you, he/she should bring a valid ID (identity card, passport) and a written authorization from you. Please use the form below. Please note: if you enrolled after the start of semester, the availability of your Student Card will also be delayed. This means, your SemesterTicket will not be valid at the start of semester as it can only be used in connection with your Student Card. Your Student Card is issued by the International Center. You can pick it up from April 1st to April 18th, further information about the exact time and place will be made available by the International Center. Please note: Students enrolled as independent Physical Education teachers do not receive a Student Card. Please note that you have to upload a photo in your TUMonline Account in advance, otherwise the card cannot be issued. Initial issue of the Student Card is free of charge. Please check the accuracy of the printed data and report any errors to the SSZ Service Desk. Before you can use the Student Card for the first time, you must validate (activate) it at one of the available stations. following every successful renewal of enrollment, not necessary for freshman! Validation deletes the information strip (TRW Stripe) on the front of the card and reprints it with the new validity date. After re-enrollment, you can immediately validate your card - it is not necessary to wait for the official start of the next semester. Note: If enrollment has not been renewed or your semester fees have not been received by TUM, the validity date of the card cannot be extended. Insert the card into the slot of the validation recorder. The display indicates the direction in which you are to insert the card. If you insert the card incorrectly, simply wait until the machine releases your card. During this process, your StudentCard will be drawn into the machine twice. Wait for the process to be completed; do not try to force the card out of the system! Only remove the card once you have heard a beep. After removing the card, check to see if the MVV logo is clearly imprinted on the card. If the logo is not fully legible or completely imprinted on your StudentCard, repeat the validation process. If after repeating the process several times, the logo is still not correctly imprinted on your card, please go to the Admissions and Enrollment Office straightaway (Serve Desk, Main Campus). At the Main Campus, Arcisstr. 21, 80333 München, you'll find two validating stations in the lobby of the admissions office, located to the left and right of the staircase leading to the library. At the Marsstraße 20-22, you'll find one validating station in Room 130 (Departmental Student Council "Lehrertum") during opening hours. At the Garching Campus, you'll find two validating stations near the entrance to the Mechanical Engineering Department, on the left near the lockers behind a column. Two more stations can be found near the entrance to the Computer Science Department off to the left (past the cafeteria and the restrooms) built into the wall. One more station can be found in the department of chemistry, near the entrance of the Cip-Pools. One more station can be found in the department of physics. At the Olympiapark Campus, you'll find one validating station across from the cafeteria next to the 'Geräteausgabe' (equipment desk). The stations at the Weihenstephan Science Center can be found in the staircase near the mailroom and in the entrance of the library. At the Straubing Center of Science, you'll find the validating station in the library near the lockers. You can reload your Student Card with cash at any charging station in the Student Union. Card charging stations are available in all canteens and cafeterias of the TUM Student Union. There are also various Touch Points (including hot drink machines and snack machines) where you can reload your card. The StudentCard can be loaded with the following amounts: €5, €10, €20 and €50. Another option is to use autoload, a system for automatic top-up via direct debit. More information about autoload is available from the munich student union. In order to protect the Student Card against damage, you should keep it in a protective plastic cover. Your bank will usually provide such protective plastic covers free of charge. Please report the loss, defect or theft of your Student Card personally to the Admissions and Enrollment Office at the Service Desk. The Service Desk will also issue your new Student Card. Note: The Admissions and Enrollment Office does not report loss or theft to the library! Make sure to have your library number deactivated in one of the branch libraries as soon as possible in order to prevent misuse. If the Student Card is reissued by the Admissions and Enrollment Office, a new library number will be assigned. Please have your library number then changed accordingly in one of the branch libraries at TUM. To receive a new student card can only be processed personally at the service desk. In the event of loss, abuse or deliberate damage to your Student Card, you may purchase a replacement for a fee of 15 €. You can pay this fee in the bursar’s office (Room 1157) at the following times: Monday, Wednesday and Friday from 9 a.m. to 11.30 a.m. Please bring your receipt to the Admissions and Enrollment Office. Outside the bursar’s office regular business hours, you may pay the fee directly to the Admissions and Enrollment Office. Reissue is free of charge if you present an official police report of the theft. Otherwise, you will be required to pay the €15 fee. Make sure to take a picture of your student card or to note down the "Chip Number" before you hand it in. The Chip Number is located on the right in the middle of your student card. The student union needs this number in order to allocate the remaining balance on your student card. 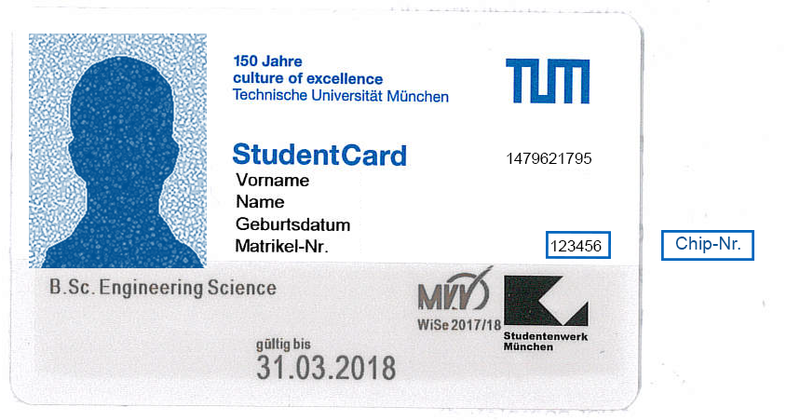 The Student Card becomes invalid when you withdraw from TU München. For further questions about the Student Card, please contact the SSZ Service Desk.